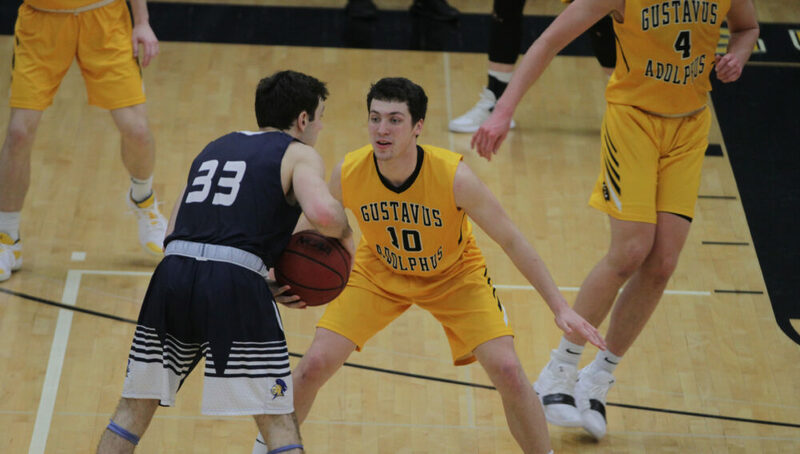 SAINT PETER, Minn. – The Gustavus men’s basketball took a 67-61 victory over Carleton at Gus Young Court on Saturday afternoon. With the win the Gusties improve to 10-11 overall and 7-9 in the MIAC while the Knights fall to 6-15 overall and 4-12 in the league. The game got off to a slow start with neither team registering a basket in the first two minutes of play. The Gusties were able to go on a 9-0 run to start the contest until the Knights responded with their first bucket at the 15:14 mark. The two teams traded scores until Gustavus got its lead to 21-12 on a Logan Rezac (So., Andover, Minn.) jumper. The Knights responded by closing the half on a 9-6 run to go into the half trailing the Gusties 27-22. The second half was a different story though as both teams shot much better and were able to sustain offense. After the Knights went on a spurt to start the half, the Gusties responded with a 17-5 run capped by an Isaac Douglas (So., Montevideo, Minn.) bucket to take a 53-38 lead with 7:28 to play. Carleton got hot though as it went on a 9-0 run to cut the lead to six. A Riley Sharbono (Sr., Marshall, Minn.) basket extended the lead back to eight but the Knights responded with a three to slash to the deficit to five. From the 3:15 mark to the 1:14 mark the Gusties were able to build on their lead to nine thanks to three-straight two-for-two trips to the free throw line and just one Carleton basket in the process. Gustavus got a scare late as it saw the Knights storm back to within four but they were never able to cut the deficit within a possession and the Gusties escaped with the victory. Rezac led all Gustavus scorers with 15 points off the bench on 5-of-6 shooting while Sharbono, Douglas, and Nolan Malo (Fy., Owatonna, Minn.) all put up double-figures as well with Malo adding eight rebounds. The Gusties will next be in action on Monday when they host St. Thomas for a 7 p.m. contest.